...where the champions of the hearts are at home! "Va Bene" is VDH/FCI registered and protected kennel name. 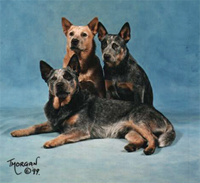 We are foundation members of the "Australian Cattle Dog Club Germany"
and supporting in many-sides this quite special breed since 1996. Va Bene ACDs delight their owner in over 15 countries from USA to Russia.